Fine Art Limited Edition of 200 - Along the Cape Perpetua coastline, there are several unique features as well. The Devil's Churn is a long crack in the coastal rock that fills with each ocean wave, occasionally exploding as incoming and outgoing waves collide. The Spouting Horn at Cook's Chasm and Thor's Well on the plateau nearby are both salt water fountains driven by the power of the ocean tide. 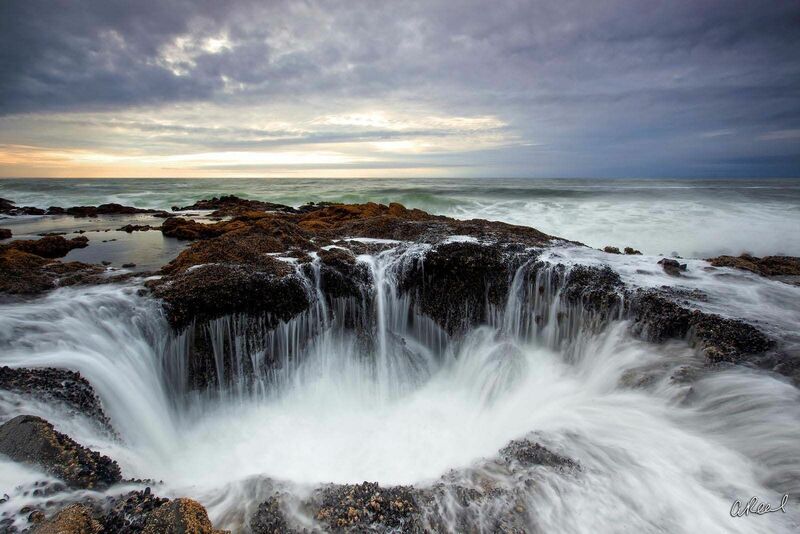 Thor's Well is at 44.278421°N 124.113499°W. Spouting Horn is at 44.277497°N 124.112994°W. Both Thor's Well and Spouting Horn are best seen approximately an hour before high tide to an hour after high tide. How spectacular the sights are is a function of the height of the high tide and the direction and size of the swells. The wind can also be a factor. Devil's Churn, Spouting Horn and Thor's Well are popular with visitors; however, all three can be dangerous especially at high tide and during winter storms.